In the Summer 2014 Classical Teacher, I wrote an extensive article exploring the question, “What is the Classical Approach to Phonics?” The contention of that article was that there are two basic approaches to phonics in the classical education world: the traditional method and the Spalding method. The Spalding method is based on the book The Writing Road to Reading (WRTR), written in 1957 by Romalda Spalding. Because the original 300-page manual is quite difficult, there have been a number of spin-offs that have sought to make the WRTR method more accessible. My original article also included a detailed comparison of the two methods. Though I left the title question unanswered, my goal in the original article was to give a thorough, fair, and accurate description of the two approaches. Many readers made up their own minds, I’m sure, but many also called and wanted our answer. In this article I will review the two approaches and critique the Spalding method in terms of the principles of traditional and classical education. For the Spalding method I will use the 1990 edition of WRTR as I did in the previous article. 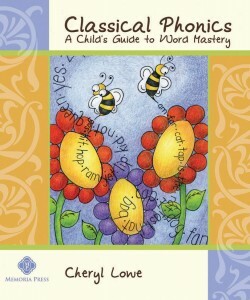 For the traditional method I will use A Guide to Teaching Phonics by June Lyday Orton. There are many other traditional programs I could have chosen, but the Orton Guide is well organized, simple, and has great credibility due to the pioneering work in phonics of Dr. Orton. Moreover, I want to emphasize that Orton is in every respect a traditional method, despite the common belief that Orton and Spalding are very similar. Traditional phonics begins with the alphabet and one sound for each letter, which are then blended together to sound out words. In Lesson 1, Orton teaches the sound of short a and five consonants, which are then used to practice blending sounds into words. Lesson 1 includes three sentences with words such as fat, Sam, mat, bat, sat, made with three “sight” words, I, on, had. This method needs little explanation to those familiar with traditional phonics. 1. Students (first grade) learn the sounds of 54 of the 70 phonograms in about 3-4 weeks. 2. Students analyze, mark, and spell in their spelling notebooks the most common 150 words in the English language, at a rate of 30 words per week. This is begun after Step 1, and requires about 5 more weeks. 4. After reading begins, the remaining 16 phonograms are taught and students continue to analyze, mark, and spell words in their spelling notebooks for a total of 780 words by April of first grade. 5. Students are tested weekly to measure spelling, using the Morrison-McCall spelling tests, and reading, using the McCall Crabbs reading comprehension tests. In Step 1 above, the 54 phonograms are the 26 letters of the alphabet plus er, ir, ur, wor, wr, sh, ee, th, ay, ai, ow, ou, oi, oy, aw, au, ew, ui, oo, ch, ng, ea, ar, ck, ed, or, wh, oa. Of these 54 phonograms, six (g, c, s, e, i, ow) have two sounds, six (a, o, u, ch, ea, oo) have three sounds, and one (ou) has four sounds. The plan of the Spalding method is to teach in isolation the above 54 phonograms and their 45 sounds from flashcards and dictation. In Step 2 above, the spelling notebook has two parts. The part which begins in the first grade consists of an analysis of spelling words taught in order of frequency of use in the English language. For instance, the first five words are me, do, and, go, at. 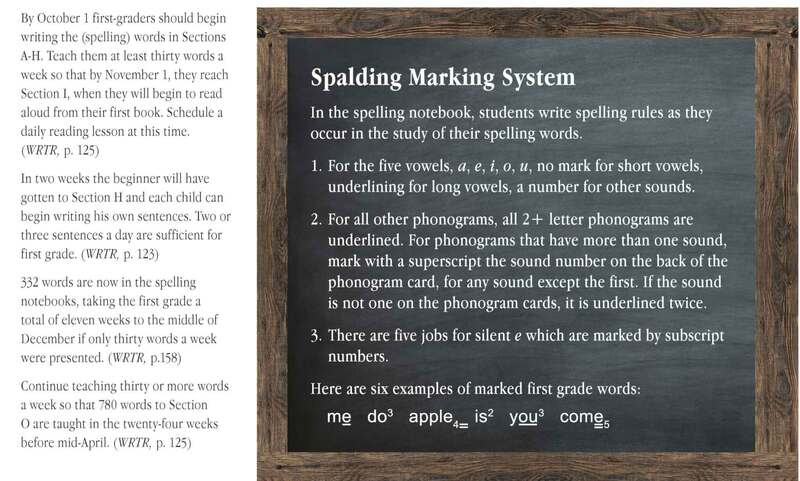 The words are analyzed using a) phonograms, b) 29 spelling rules, and c) the Spalding marking system summarized in the sidebar at the right. It should be clear from the five steps of the Spalding method that it is radically different from traditional phonics. The first problem with the Spalding method is that it puts spelling before reading and argues that spelling is a necessary basis for reading. This is a curious idea which I have never seen anywhere else and is, in fact, inconsistent with the definition of phonics. Phonics is the teaching of letter-sound correspondence for the purpose of learning to read. Reading requires the skill of decoding—recognition of phonograms for reading and sounding out unfamiliar words. Spelling is encoding, a much more difficult skill that lags far behind reading. All readers, beginning as well as advanced, are able to read far beyond their ability to spell. To require spelling as a prerequisite to reading is getting the cart before the horse. We wouldn’t ask a child to walk before he could crawl, or run before he could walk. It is typical of modern education theory to confuse the order of knowledge with the order of learning—to focus on the advanced skill and neglect the basic skill. Spelling lags far behind reading and, while it strengthens reading, should not limit or impede the goal of fluent reading. Once students start to read real books as opposed to phonetic readers, phonics and spelling are intertwined and continue to reinforce each other throughout the elementary years. WRTR requires students to learn 54 phonograms in isolation and the spelling and analysis of 150 words before beginning to read. Why all of this frontloading? In what other subject would we frontload skills and knowledge and then ask the beginner to navigate his way through a surplus of information in order to select and use what he needs? Do we teach algebra this way? Piano? Soccer? All good teaching involves incremental lessons—small steps that give bite-size skills. This frontloading is the fundamental flaw of WRTR. It is an egregious error. Let me illustrate the process of reading for the WRTR child when he sees the word cat, a word not found among the first 150 words in his spelling notebook. The WRTR child must analyze cat, using three sounds of the phonogram a, and two sounds of the phonogram c, and whatever spelling rules he has learned that may apply to this word. I have personally seen WRTR students struggle to read many words as simple as cat, while at the same time capable of rattling off a bewildering array of rules and phonograms and sounds. Incredibly, Mrs. Spalding does not include in her 29 Spelling Rules the very rule that the WRTR child needs to read the word cat. It is an extraordinary oversight that she missed the most consistent and basic phonics rule in the English language, “the vowel in a CVC (Consonant-Vowel-Consonant) word is short.” This is the phonics pattern that all traditional phonics programs begin with, but it is not mentioned by Mrs. Spalding. By contrast, how does the traditional phonics student learn to read the word cat? Since he has only learned one sound for each letter, the only skill required of him is to remember those sounds and practice blending them together. Learning this one basic pattern, which applies to words with initial and final consonant blends and many multi-syllable words, enables the child to read thousands of new words. Traditional phonics is incremental; each new skill is taught after the previous one has been thoroughly practiced. For instance, after the short vowels, the student learns the long vowel sounds and silent e rule. Next he may practice consonant blends, and then learn some of the long vowel teams, such as ai, oa, ay, one or two at a time, all of which he practices not in isolation but in word families. No frontloading, just step-by-step learning. Spalding is rigorous phonics, but it is not systematic phonics. WRTR teaches 54 phonograms all at once. This is definitely rigorous, but it is not orderly. Order implies a hierarchy, categories, a selection, a plan. Drinking from a fire hose is not a plan. Learning 54 phonograms in isolation is overwhelming and lacking in structure, but Mrs. Spalding then compounds her error by teaching students to apply the phonograms in a completely random order, the order found in the 150 most common and irregular words in the English language. Traditional phonics teaches phonograms in a logical order, beginning with one sound for each letter and proceeding from the most common and most regular patterns to those that are less common and less regular, each pattern applied immediately in word families. This order has been worked out over time by teachers and linguists, and though it may vary in some details, it is a thing of beauty. This order is completely obscured in WRTR. I cannot see how either the teacher or student could develop any understanding of the underlying order of the English language or how to teach it—from WRTR. Spalding has no relation to traditional or classical phonics. Spalding is rigorous phonics, but it is not systematic phonics; it is not incremental phonics, and it is not common-sense phonics. The task of remembering the 70 phonograms, many with multiple and overlapping sounds, taught in isolation with no aid to memory provided by actual words, pictures, or word families, and concurrently remembering 29 awkwardly worded and abstract spelling rules as a basis for reading is a remarkably obtuse and unnatural method—it is easy to mistake this confusion with complexity. There have been many who have worked hard to rewrite WRTR, to make it more user-friendly and provide the details and materials needed to implement it; they are to be commended. From what I have seen, most of them have improved WRTR and corrected some of its most egregious faults. But it is time to recognize that WRTR is fundamentally flawed and reject it as unsound, putting our efforts instead into developing sound phonics and reading programs based on traditional methods that work. I would also submit that its use by the classical education movement is unfortunate and undermines the credibility of our movement. But the question remains: What is the appeal of WRTR and why has it persisted so long? I think there are two reasons. 1. With its 70 phonograms, 29 spelling rules, and marking system, WRTR appears to be comprehensive and rigorous. We classical educators are serious, and this is appealing to us. But increasing complexity and confusion is not evidence of rigor. It is evidence of poor teaching. 2. With its 70 phonograms, 29 spelling rules, and marking system, WRTR claims to greatly minimize the irregularities of English spelling. We classical educators like order and discipline. We want to believe that English spelling can be reduced to a predictable system with only occasional irregularities. We think this is a necessary argument against the anti-phonics crowd. But here is the real truth. English is the most irregular of all of the modern languages. It is, in fact, in a class by itself. Not only does English have many phonograms with multiple sounds, it has many sounds that are spelled by multiple phonograms. There is an average of eight different ways to spell ea ch of the long vowels in English, and there are few, if any, rules that govern these variations. If you know that it is boat rather than bote, it is not because of a rule but because you have seen the word spelled correctly many times. English has 19 vowel sounds, as compared to five for Spanish and Italian. Due to its complex history, there is no end to the richness and irregularity of the English language. For this reason, English-speaking children take longer to become fluent readers and take even longer to become proficient spellers. But the irregularity of English is not an argument against phonics; it is an argument for phonics. Most languages don’t teach phonics because their alphabets are regular and phonetic. In most other languages, the alphabet is the only phonics needed. For English-speaking children, the alphabet is only the beginning. For English-speaking children, systematic, incremental, and common-sense phonics is the classical way to teach our children how to read and spell.